I’ve noticed that lots of people are finding their way to our site after searching for something about Lambert’s Cafe (we’ve previously shared a couple of photos taken in this unique dining establishment). 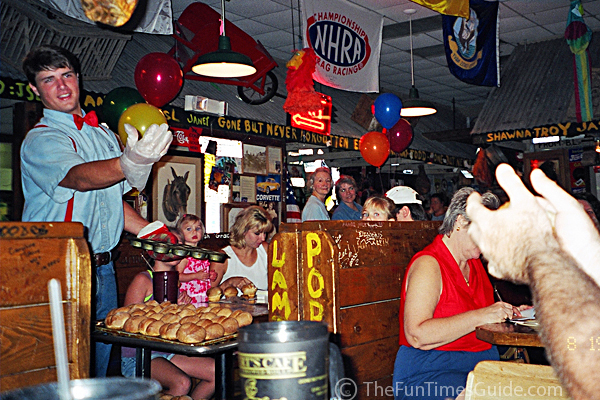 Following are some other photos we took at Lambert’s Cafe, “home of the throwed rolls”. Check out the Lambert’s Cafe website to see why it’s such a unique place to visit — and why they THROW ROLLS at you in the first place! If you’re looking for a good laugh, check out this full-length music video of “Hillbillies Like It Like That” — a new catchy tune from Hot Apple Pie.